The Challenge:Built to Last, the defining management study of the nineties, showed how great companies triumph over time and how long-term sustained performance can be engineered into the DNA of an enterprise from the verybeginning. But what about the company that is not born with great DNA? How can good companies, mediocre companies, even bad companies achieve enduring greatness? The Study: For years, this question preyed on the mind of Jim Collins. Are there companies that defy gravity and convert long-term mediocrity or worse into long-term superiority? And if so, what are the universal distinguishing characteristics that cause a company to go from good to great? The Standards:Using tough benchmarks, Collins and his research team identified a set of elite companies that made the leap to great results and sustained those results for at least fifteen years. How great? After the leap, the good-to-great companies generated cumulative stock returns that beat the general stock market by an average of seven times in fifteen years, better than twice the results delivered by a composite index of the world's greatest companies, including Coca-Cola, Intel, General Electric, and Merck. The Comparisons: The research team contrasted the good-to-great companies with a carefully selected set of comparison companies that failed to make the leap from good to great. What was different? Why did one set of companies become truly great performers while the other set remained only good? Over five years, the team analyzed the histories of all twenty-eight companies in the study. 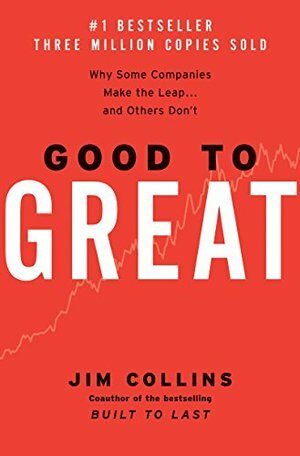 After sifting through mountains of data and thousands of pages of interviews, Collins and his crew discovered the key determinants of greatness -- why some companies make the leap and others don't. The Findings: The findings of the Good to Great study will surprise many readers and shed light on virtually every area of management strategy and practice. The findings include: Level 5 Leaders: The research team was shocked to discover the type of leadership required to achieve greatness. The Hedgehog Concept: (Simplicity within the Three Circles): To go from good to great requires transcending the curse of competence. A Culture of Discipline: When you combine a culture of discipline with an ethic of entrepreneurship, you get the magical alchemy of great results. Technology Accelerators: Good-to-great companies think differently about the role of technology. The Flywheel and the Doom Loop: Those who launch radical change programs and wrenching restructurings will almost certainly fail to make the leap. “Some of the key concepts discerned in the study,” comments Jim Collins, "fly in the face of our modern business culture and will, quite frankly, upset some people.” Perhaps, but who can afford to ignore these findings? Reading Good to Great, after The Originals and Quiet has given me a better foundation for creating the kind of nonprofit I'm hoping to create. Reading about quiet CEOs who have a love affair with their work is more important to me than reading about charismatic leaders who are always present outside of their business. In Good to Great I found the advice timeless, and it spoke to other books I've read about putting the business first. As I read this book one issue was present: a few of the companies profiled are no longer in business. And it made me interested in reading a book about what happens to great companies that falter and then close. In one of the last two chapters Collins does address this in passing, that a great company that hires a leader who is charismatic and not looking at what's best for the company can take a company from great to out of business. If you're like me and you've read the business magazines and you don't see yourself reflected by CEOs then I suggest that you read the three books I've mentioned. You'll read about quiet leaders who created great businesses. Хотя книга рассказывает о том, как построить великую КОМПАНИЮ, по-моему, эти же принципы подходят и для построения своей личной жизни. Ведь каждого человека можно рассматривать в т.ч. и как некую компанию.